1. 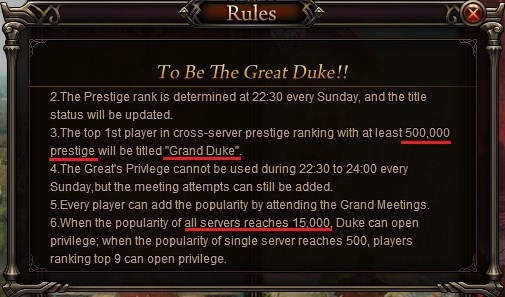 Point 3 ->; where/how to see if someone have the;tittle \'Grand Duke\'?? Already have 500K prestige, but nothing happen. 2. 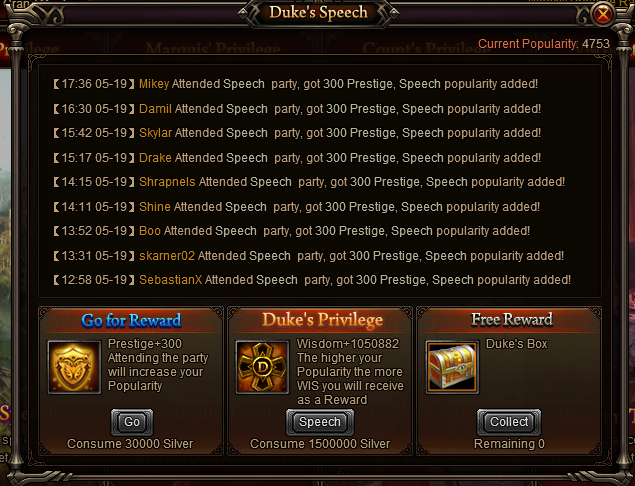 Point 6 ->; Did that meant Duke\'s Speech need to reach 15K speechs to make it claimable? LOL, 1 year is wont enough to reach it. I\'m not sure but maybe this feature isn\'t in yet i\'m at 940k prestige on my server, around 3848 popularity it say\'s 15,000 of all servers not sure what that means or how it is tracked but our server would never hit that without some sort of merge, is pretty dead lately. 2019-4-21 02:59 GMT+8 , Processed in 0.051987 second(s), 38 queries .